Leon Hunter Handley, I was born in Lakeland and after 30 months in the service and seven academic years at the University of Florida, I came to Orlando and I’ve been here ever since. 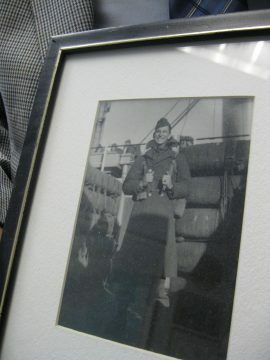 Leon Hunter Handley holding a photo taken of him getting off the ship in Korea just after WWII. Mr. Handley is a Florida native and was the first Air Force Cadet Colonel in Florida R. O. T. C. history. Photo taken in his law office in downtown Orlando, December 11, 2012. When I came I was single, first of all, and secondly, I was without funds. I had saved $5,000.00 through various jobs that I had as a child and then my time in the service and then working while I was going to the university. I accumulated $5,000.00 dollars, but I wasn’t about to spend that on joining a club. 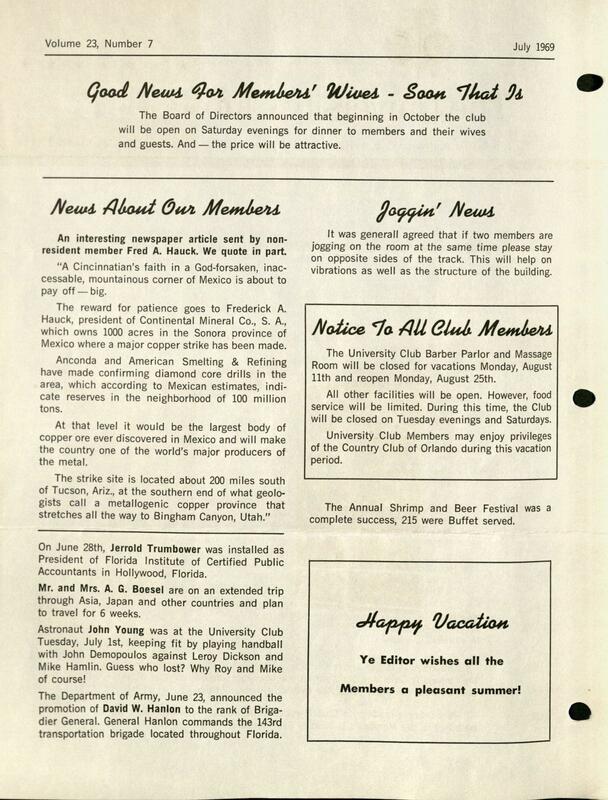 Claude H. Wolfe, new chief of the Greater Orlando Chamber of Commerce…University Club News, May 31, 1937, Vol. x, No. 5.
was an active and energetic member of the University Club. So he made his Tuesday dinners every week here at The University Club. He enjoyed playing gin rummy at noon and he had a fraternity here of the leaders of the City of Orlando and Orange County. 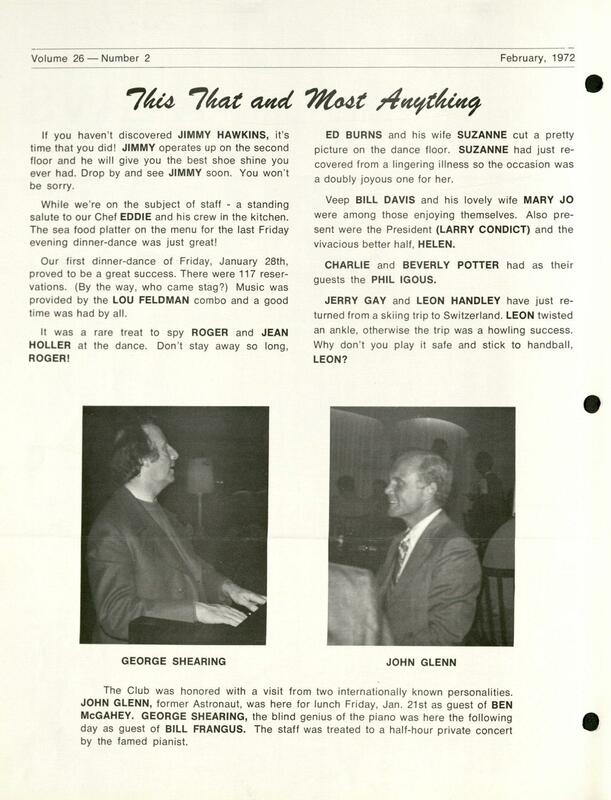 They truly gathered at The University Club on a regular basis. So I thought it’d be a good idea to join The University Club and I did so. I’ve been an active member ever since. So it was where I met the gentlemen who ran, they thought they did, and they probably did run this area. Fine people. Wonderful people. Very civic minded. I’ve enjoyed it immensely. I’ve never been a card player. I just never cared for it. I used to play a little bridge, but my wife complained that all I did was talk. I did not concentrate on the cards. I had precious little interest in them. No, I was not a gin rummy player or a poker player. They used to have a good poker game or two here at the club. I participated in handball. I started playing handball here. I had played handball at the university – outdoor handball, three wall – and this was the first four wall handball I played. So I thoroughly enjoyed that. So for the next 60 years or so I played handball. That was my major activity here: Working out in the gym and playing handball not racquetball. 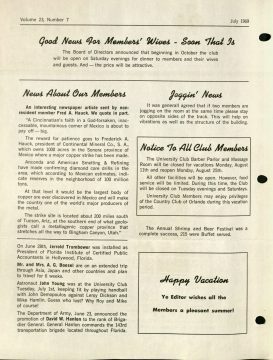 The University Club News, Spetember 1968, page 2, Volume 22, Number 9. VIEW. And I would run from here. We had a track up on the roof at one time and I would run around town. But athletics were really what attracted me mostly here. Photo of the jogging track on the roof of The University Club, March 1975. I would have lunch when I could. I was very busy in those days trying lawsuits all over Florida and I would be out of town a great deal. But when I was in town I would walk down here from the office and have lunch and shoot the bull a little bit. Maybe go watch them shoot a little pool in the pool room. One day I went to sleep and fell off the couch… much to the amusement of every other person in the room. And I was tired in those days. So, I enjoyed the camaraderie and the fellowship. The exchange of ideas and just the joy of having a place to go where you could put your hair down and not be on stage. For the most part, you would be able to get away with whatever your thoughts were, your attitude for that day. You always have to have a thick hide around here because the guys would really get on you if you wear an elaborate tie or a different or unusual jacket or your hair needs cutting – you’ll hear about it. They’ll tell you. And, it’s been fun. “Jerry Gay and Leon Handley have just returned from a skiing trip to Switzerland. Leon twisted an ankle, otherwise the trip was a howling success. 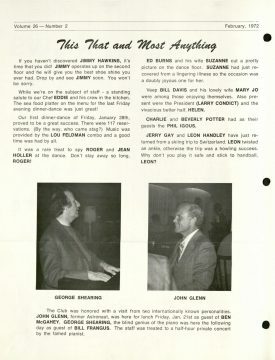 Why don’t you play it safe and stick to handball Leon?”,The University Club News, February 1972.
Who did you play handball with? Oh, we had a great long list of people who played handball. We had several physicians: Dr. Robert Trumbo, and Dr. Robert Young. They were both very good handball players. And they had played four walls before we had our four wall courts here. So, they were way ahead of the rest of us. They won all the tournaments. But, Dr. Carl Dann, a whole long list of fine people. Colonel Jack Bolt, who was a really wonderful heroic Marine colonel. He was an ace in two wars. The only Marine to accomplish that feat. He was one of eleven men who have been designated aces in two wars. He was from Sanford. He retired from The Marine Corps and returned to Sanford and went to work with Chase & Company. He would come play handball with us. 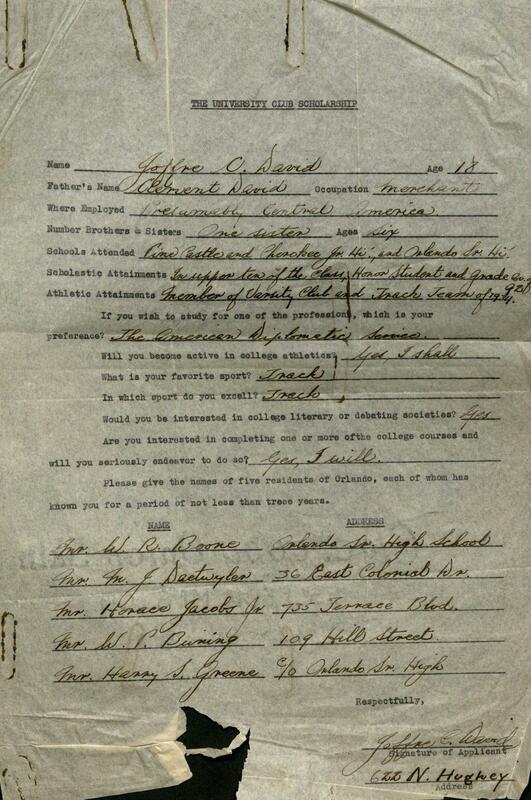 He and Dr. Trumbo were both ATO’s at the University of Florida before the war. And the war had caught them up and they were both gone in WWII. And Jack stayed in The Marine Corps and Robert, of course, got out and went to med school, was a thoracic surgeon here. But way back there, Dr. Robert Zellner, a wonderful surgeon here in town, was a very active handball player. And John Young, the astronaut who played handball with us here. “Astronaut John Young was at the University Club Tuesday, July 1st, keeping fit by playing handball with John Demopoulos against Leroy Dickson and Mike Hamlin. Guess who lost? 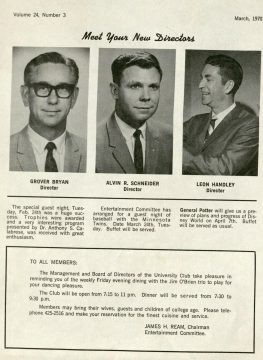 Why Roy and Mike of course!“, The University Club News, Volume 23, Number 7, July 1969. He and Johnny Demopoulos, classmates in high school (and, incidentally my wife, Mary Virginia Wolfe, was a classmate of John Young here at OHS, Orlando High School,) he would play with us when he would come to town. Bill McBride, another Marine, a great lawyer from Holland & Night would be in town for one reason or another and he would play with us. He’s now deceased. He ran for governor later. We had a great group of handball players here locally. Van Connelly, a citrus man, and Tom Kelly, who was all, everything at the University of Florida, engineer. He played football up there. He was a great handball player. He played with us. Although he was so much better than we, he tolerated us. He just used us to warm him up. He participated in all the big tournaments around the state and the nation. He was nationally ranked. “Leon Handley was speechless upon receiving the winner’s trophy for the class ‘B’ handball event”, VIEW photo in The University Club News, Volume 28, Number 4, April 1974. Tom Thomas, a CPA, he and I won the doubles championship one year. He told me to just stand in the corner. He won single-handedly in essence. But, Danny Fulford was very, very active, a great handball player. We had a super group. And they’ve sort of here late fallen by the wayside most of them. But now, a much, much younger group is playing topside in the handball courts. And we will continue to have those courts in the new clubhouse which is helpful and encouraging. But racquetball has come into its own and I’ve read reports in “The Wall Street Journal” in such prestigious places as Harvard they’ve practically come to fist fights between the handball players and the racquetball players. Because they use the same court and essentially the same rules. But the racquetball players get out on the court and they play seemingly interminably and the handball players get very annoyed because they want to get on the courts. The handball players are thought to be a bit of a rougher element as compared to the racquetball players. I think they’re just a different breed of cat. I’m 88 years old. I’ve always been active physically. I was a runner way back before it was cool to run. And as a child growing up in Lakeland I just liked to run. And I stayed in good physical condition. I’ve never had a weight problem fortunately. And I used to tell people that I had a perfect formula for staying thin: money troubles and a mean wife. To which my wife would say, “That’s not funny.” As she said about most of the things I said. But I did try to stay healthy. We had four children. I used to pray to the good LORD that he’d let me live long enough to get the children raised. I wanted to participate in their upbringing and I wanted to be able to provide for them so that they could get their education and be prepared for life. And the good LORD allowed me to keep at it. And I’m still working, still offering to practice law. If the offer’s accepted I find someone to do the work. But I’m still going to the office every day. And I’m still trying to stay active. I’ve been very blessed physically. God gave me a good mind and I developed it. I was the first member of my family to graduate high school on both sides. My people were country people. My mother was born in Stark in the jailhouse as was her mother in the same jailhouse for the same reason. Their fathers were the sheriff at the time of their births and the sheriff lived in the jailhouse. Good thing for my mother, she was the tenth of ten children. And, of course, many of them were already married and out of the house by the time she came along. Her oldest sister was 24 years older than she. So the formal education was not very high on the list in those days with the country folks. They went to work as soon as they could, many of them farming. My father was raised on a farm first in Alabama and then in Florida. He came down to Florida as an infant with his parents and older brother. They stopped first in Floral City over in Citrus County. My father said, “It was neither floral nor a city.” To my knowledge it’s still neither floral nor a city. But it’s a lovely area of the world over there with all that limestone. They had some lime rock ruins in those days, hard rock. And the family went on down to Polk County just north of Lakeland and lived on a farm. My father got to high school, but he did not graduate. He went to work. And then WWI came along and off he went. 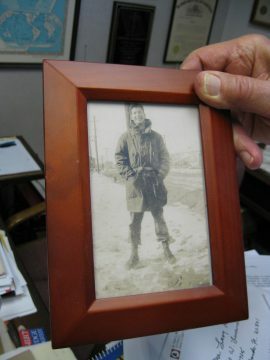 He and his brother into the Army in WWI. 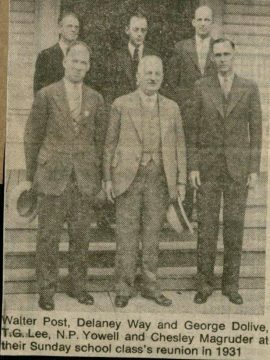 Curiously, Billy Beardall, who was Mayor of Orlando, and was a very active member of The University Club, and loved playing poker down here, found a company in WWI for the Florida Volunteers, The National Guard. The company he formed, Company B, here in Orange County and down in Osceola County Mr. Funie Steed who was a member of this University Club for many years, he and his brother Mike, Mike Steed, younger brother, practiced law here for many years until their deaths, and he formed Company C of that unit. And then as I understood it he could not pass the physical so he waved good bye to the people he recruited and when they came home after the war he had moved to Orlando. He decided he didn’t want to be there when they got home apparently. And down in Polk County, Company D was formed and a man named Stikes, Captain Stikes was head of Company D. And my brother, my father’s brother, Etheridge, who had been a horse soldier hunting for Pancho Villa with General Pershing, he was then Colonel Pershing, he was head of the American Expeditionary Force, and my father both joined Company D and went off to WWI up to Camp Gordon in Georgia. And my Uncle Etheridge went overseas with General Pershing in the AEF. And my father was made a lieutenant and assigned to conduct the funerals of the soldiers who died from influenza. The great flu epidemic that killed more people worldwide than the World War did, curiously, it was the same strain that came back here about ten years ago. And they said those who were born before 1930 or so would probably have a resistance built up to that strain of influenza. One advantage of being old. About the only one that I can think of. The background that I had was for doing the right thing and accomplishing what you could and getting an education to prepare yourself to be of service to your fellow man. My mother wanted me to be a Baptist preacher. I probably would have made more money. My father wanted me to be in business, but he admired lawyers. And he inspired me to be a lawyer. A lawyer from his community was over in Tampa, a very outstanding lawyer. He pointed with pride to that man who had humble beginnings: Baptist preacher / farmer. In those days many preachers just preached on Sunday and they farmed all week. He was that upbringing and he had become an outstanding leader of the Tampa community and an outstanding lawyer and very, very successful and my father pointed with pride to him and inspired me. So, I thought I’ll try it and I went to law school. It’s been very interesting. And I must say that, of course being in the law practice, there are a lot of organizations that you run up on and professional organizations, and they invite your participation. But, a lawyer ought to contribute to his community and to his church or her church. And, of course, family requires a good deal of interest and energy and keeping abreast of what’s going on in your profession. Keeping prepared and just doing the work. 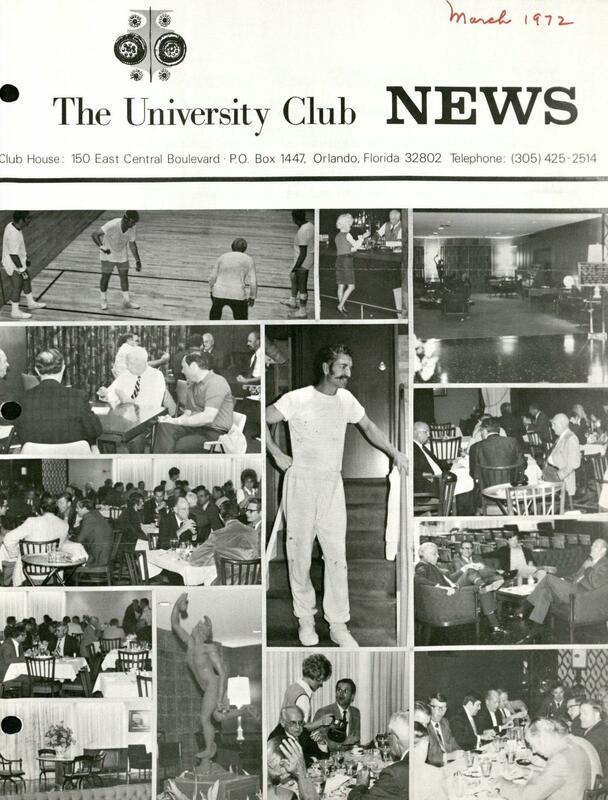 It’s been a busy time and The University Club’s been very much a part of it all those years. Leon Handley, University Club Director portrait, The University Club News, March 1970, Volume 24, Number 3. I’ve enjoyed civic work also. I’ve been an active Rotarian for many, many, many years. I was President of the Rotary Club. I was an active Kiwanian before that. I was active in the Bar. I was President of the local bar and state President of the Junior Bar, the lawyers under 35. I’m a member of the Board of Governors for the Florida Bar. I’ve also been active in business, invested in real estate. I ran two orange groves for many years and had a cattle ranch for many years. My father was always in the cattle business as well as being a business man. He ran a company in Lakeland for 47 years, an industrial supply house that supplied mines and mills and was named: Mine and Mill Supply Company. When he passed away in 1965 at the early age of 69, he had cancer unfortunately, I went on that board and I’ve been on that board ever since. I’m now chairman of that board. And it meets once a month and we have responsibility of running that company. It was found in 1909 so it’s been in business for 107 years now. And we hope it will be in business another 107 years. I’ve also taught a Sunday School class at the First Presbyterian Church where I’m an elder for 60 years. And the class I’m teaching was formed in 1906 with twelve, twelve year old boys including Chesley Magruder with the Magruder Foundation and T. G. Lee, Thomas Gilbert Lee of the dairy and ten others, Delaney Way, the son of Mayor Sam Y. Way and nine others likewise active business people here in the community. Photo published in The little sentinel, October 9, 1981, E, “Church’s history finds a home” . And Mr. Linton Allen who founded First National Bank of Orlando which became Sun Bank, now Sun Trust, a very, very active member of that class. All of these interests have added a great deal of flavor to my life. When I went in the service I was able to go to sea as an 18 year old ship’s officer and carried coal to the Mediterranean immediately after WWII for the people there, part of the Marshall Plan. 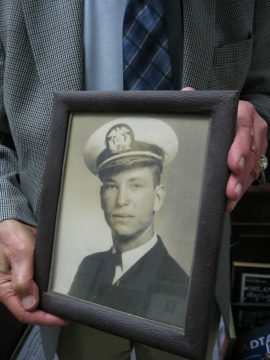 Photo of Leon H. Handley taken at age 18 before going to sea to serve as a Merchant Marine in the United States Maritime Service. View photo. And then I joined the Army because I was not going to be a veteran if I stayed in The Merchant Marines. And the Army sent me to Hawaii, Japan, China, and Korea. Photo of Mr. Leon H. Handley serving as Sergeant in the United States Army in Korea. So I got a taste for travel and I’ve continued to travel all my adult life. Travelers’ Century club has divided the world in 321 destinations. They say “Countries,” but I say, “Destinations” because they’re not all sovereign nations. I’ve been to 240 of those and ten others that they have now discontinued. So I’ve been able to see a great deal of the world and I have just thoroughly enjoyed it. It’s of great interest. I’ve made many, many, many talks on many subjects. They used to regularly report on these exotic trips to Antarctica and Africa, north of the Arctic Circle. All over the U.S.., all over Africa, all over Europe, all over Asia, and I’ve been to Australia a half dozen times. It’s been very, very, very interesting…. Did you give presentations here at The University Club on your trips? Yes, yes I’ve spoken here. And I used to take slides back in the slide days and I had some wonderful slides…. So that has added another facet to my life. I’ve often said, “That I’m the most blessed man ever to have lived in the history of mankind.” I have seen and done and been where I never thought I would go to see and do. And it has been just fascinating. again, one of the great pleasures has been this club. It’s meant so much to me. And the City of Orlando, she’s treated me so well, so well. 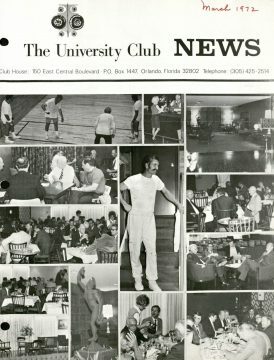 The University Club News cover featuring Leon Handley, center, with the outstanding moustache he grew while hunting in the Yucatan, March 1972. Orlando High School was our last game in Lakeland. We were the Dreadnots. We dreaded nothing, that was the idea. The name originated with The British Navy. The had a battleship, The HMS Dreadnot, an ironclad battleship. And supposedly it was the terror of the ocean. It dreaded nothing. Nothing could stand up to it. And then they started calling all the battleships Dreadnots. So our team is the only team that I know of in the world that calls itself Dreadnots. We would play OHS the last game of every football season. One year here and then one year back in Lakeland. I participated in that back in high school and I never dreamed that I would live here. And still, often wonder how it all happened. But Orlando has been so good to me. It’s had it’s hand out to me ever since I arrived. It’s been very, very, very kind, thoughtful and, of course, my wife’s family was very active, very prominent. That helped I’m sure. And I practiced law with a man named Tom Gurney. J. Thomas Gurney for 40 years. We were partners for 40 years. He passed away and we continued the firm, Gurney and Handley. That was fulfilling. He was extremely active in the community and in the bar and in business. He was a very successful Mississippian, a countryman himself. He came here in 1921, found a partnership with Mr. Leroy Giles: Giles and Gurney. And many of the outstanding lawyers who were leaders of the community and leaders of the bar when I came to town were postgraduates of the Giles and Gurney firm. And we, he and I, had a long string of outstanding lawyers who came through our firm, and many of whom are still active in this community. Many have long since retired. But very successful, very outstanding lawyers. He was president of The Florida Bar Association before we had the integrated bar. It was the social organization until then. They integrated the bar in 1950 so to practice law you must be a member of The Florida Bar with The Supreme Court controlling its activities. So all those aspects contributed to my having been accepted here. And it had a lot to do with I’m sure my success. The fact that I had these outstanding people who were interested in me and wanted me to do well and do good which I’ve tried to do. Are any of your children members of The University Club? I always envisioned that I would have five sons and they would all live right around me and be a part of my law firm. And that we would see each other on a regular basis and I would be at the head of the dinner table and they would be packed around me with all their children and grandchildren. It didn’t work out that way. Our second son is three daughters and they’re spread out. They’re spread out all over the countryside. Our son went off to Vanderbilt and worse than that he became a Sigma Chi at Vanderbilt. Of all things. He was not an ATO. I suggested to him that he could transfer schools, but he could not transfer fraternities. And he said, “I know.” Apparently it was part of his reasoning. Our oldest daughter lives in north Florida. She married a lawyer and he was from Hamilton County. Their name is Adams. And the Adams Family was very active up there for many years. He’s the county attorney there and they lived here in Orlando for 20 years while their sons were growing up. They wanted him to go to their elementary and their high school here. And when they graduated then they went back to the farm so they live on a farm. Their second son, Jack Adams, is a lawyer here in town, Jackson Adams. Six feet six inches tall, he’s the tallest of all the Handleys. And he practices law here in Orlando and is a member of the club. [The University Club] He practices in the firm with counsel Wooten who is a member of the club. So I’m proud of him. And her other son lives in California her older boy. He’s out there in business, in sales. He has three children. Our next daughter, Mary Ellen, by the way is a very talented school teacher and taught at Lake Highland here for many years and then has been teaching up in Hamilton County and has retired recently from teaching. Our second daughter, Laura, lives in Knoxville, TN. She went to FSU and married an FSU graduate who was a professional soldier, ROTC graduate there, helicopter instructor pilot. And they took an early out from the service and he is in business in Knoxville. They have two daughters, one of whom, the older is a teacher in Daytona. And the younger daughter is a scientist in California having received a Master’s Degree in biology, marine biology and is employed by one of the heliosphere instructions out there that’s interested in the Pacific Ocean. Her husband is also with a Master’s degree as is their older girl she has a Master’s degree. But Sarah our second granddaughter is employed in San Francisco and they live in Santa Cruz. He designs. He works for a company that designs and manufactures medical machines that assist the body like artificial hearts and that sort of thing. He’s an engineer. Both of them Clemson graduates. Our third daughter is unmarried. She never married and she lives here in town. She looks after dad. She calls me every day to see if I’m all right which I appreciate very much. She runs the little beach place that we have in Ormond and has her home down in southeast Orlando. And has spent many years in the airline industry. 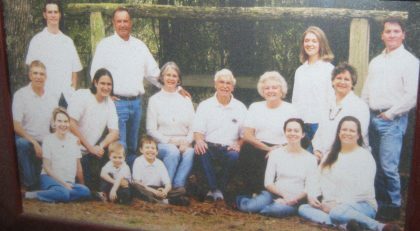 Mr. Leon H. Handley and his wife, Mary Virginia Handley, are pictured, center, with their family. So that’s our family. Oh, our California granddaughter has one child so we have four great grandchildren, six grandchildren, four children, and unfortunately, Mary Virginia, my wife passed away April 27, 2013, coming up on the third anniversary. And that was a heavy blow. We were married 60 years and we buried her on our 60th wedding anniversary. It is a great loss. She was a wonderful lady. A wonderful mother. And the family isn’t the same. She had so many friends. The outpouring at her memorial service was just marvelous, inspirational. They’ll probably be a big crowd at mine, too. Some will come to say their farewell and others will come to be sure I’m dead. Like the wonderful movie about the mobster and the fellow had a hat pin. He wanted to be sure he was really gone…. Dear Henry West, who was just, he was the majordomo here. He was such an accomplished person and so bright and so learnt and so talented. He had a wonderful habit of if the phone rang and he answered it you could hear him say, “Yes, mam, he just left.” Then he would go to the member and say, “Your wife just called,” which I thought was priceless. And he was succeeded with Tommy Singleton and his portrait is hanging there in the entry foyer of the club. Russell Hughes, one of the members of the club here, had that commissioned to paint Tommy’s portrait and gave it to the club. 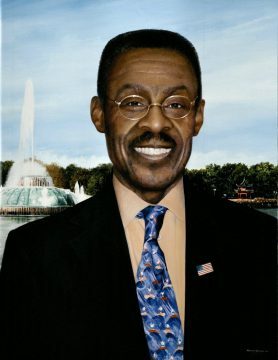 Portrait of Tommy Singleton commissioned by Russell Hughes for The University Club of Orlando. He took over from Henry and for the rest of Tommy’s life he looked after us here and was our majordomo with things going along swimmingly under his direction. And we’ve had some marvelous managers through the years. They’ve kept everything on an even keel; businesslike activities here to keep the club afloat. And many, many, many lovely sweet, kind talented ladies and gentlemen who worked here and helped in every way with a lot of students working here through the years. And, of course, the club has not just been here for our fun and entertainment and comfort. But it has been very active in giving scholarships. And those scholarships have been going on for a long, long, long time. 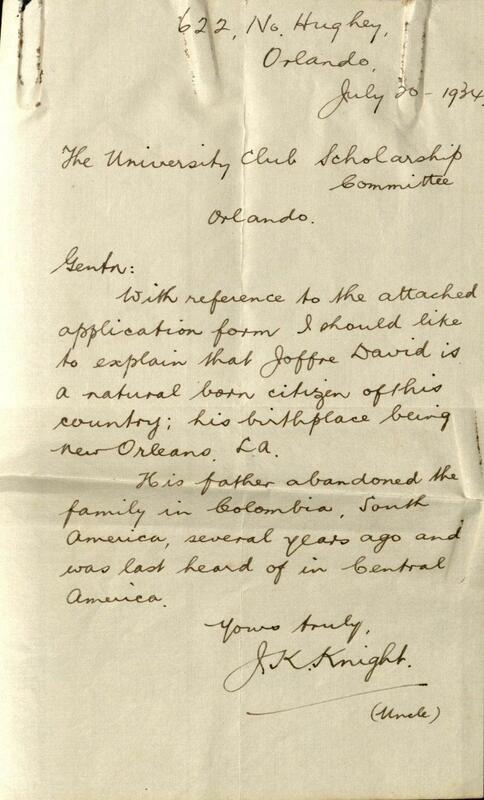 Joffre C. David’s application for The University Club Scholarship with the attached letter from J. K. Knight, his uncle, dated July 20, 1934. View letter. The University Club of Orlando has donated over $1.5 million in scholarship funds for individuals attending colleges and universities in Florida. I’m sure the number is staggering of what this club has contributed to the welfare of this entire area by its scholarship funds. They award them once a year and they have a fine dinner here and they invite the recipients in and award the scholarships at that time which has been a very, very outstanding contribution, in my judgment, to the community. And, of course, we’ve given a lot of community leaders a place to blow of steam and let their hair down and be one of the boys and know that they’re not going to be embarrassed by whatever goes on here. In the process, there have been a few bumps in the road for various members of the club who have had some heated discussions and I’m sure even some instances where it got even more heated than simply a discussion. But that happens in the best of families. We’ve been quite fortunate that our membership has always been very responsible and we appreciate that. 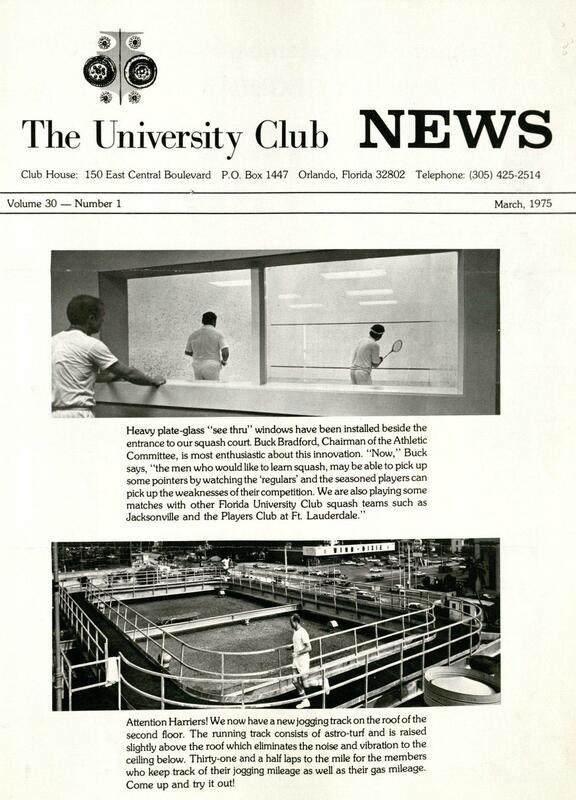 Would you agree that The University Club has contributed to the economic development of our community? Oh, I think so. I think, I’m sure some people have been delighted that they moved here because of The University Club. And some may have moved here because of The University Club. The social side, of course, for many, many years we were a men’s club. So it was, men being men don’t go out of their way to reach out and we sort of wait until somebody expresses an interest. It wasn’t a family club as such although we would have Family Nights. And we would have Santa Claus for the children and lots of family activities but the membership was exclusively men for many, many years from its founding until somewhat recent times. A country club is more of a family club. They have a different function. But this was essentially a professional men’s organization and it was utilized in that way. Just dinner one night a week. And, of course, there’d be activities of various sorts: Christmas get together and the lunches every weekday. Of course, we’d have Mother’s Day dinners and Valentine Parties. All sorts of social gatherings. Mr. and Mrs. Leon Handley dancing at The University Club of Orlando’s St. Patrick’s Day Dance. 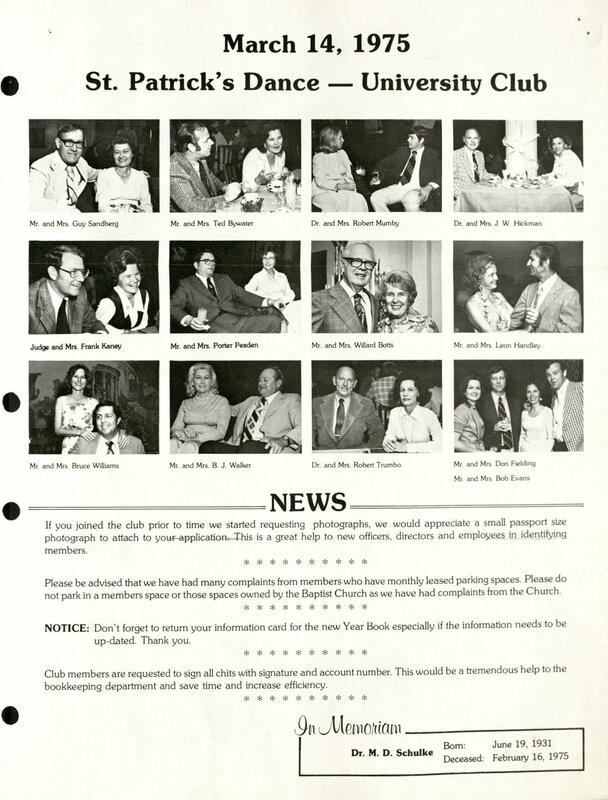 Photo published in The University Club News, March 1975, Volume 30, Number 1. The Christmas – New Year’s Open House where the whole community would come in it seemed like. All those contributed to the richness of this community in its social life in my judgment. 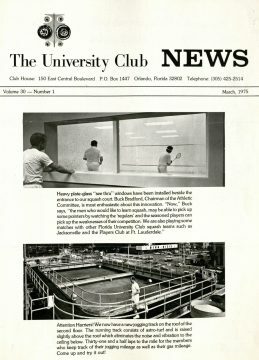 What do you see as the future of The University Club? Well I certainly hope and trust it will flourish. We’re going to be part of a high rise now and not a separate free standing building. And it will be a residence building and I would think that the people in the residence building would be interested. The community has changed markedly in that people are living downtown which was not the case when I came to town. There were a few residences still downtown, single family homes. But there were no downtown subdivisions which is what these huge buildings are; in essence these downtown buildings are vertical subdivisions with many people living there. And I would think they would have a place to play with the downtown notion that we’re going to have. Just as the library will be changing its approach to things and evening hours will be even more important I would think. When you have people living in close proximity to, in the library I’m speaking of the Main Library here on Central. We would be a source of great enjoyment for the downtown community. It’s hard for me to believe that we’re going to have an urban community here. All these enormous buildings that have been built and are being built and will be built in Orlando. It just boggles my mind. Because I remember the quiet community that we had here, a small town with the main industry being citrus. And, of course, some tourism, but nothing like what’s going on today. I would not have believed it and I almost still cannot believe it. Am I going to believe what I think is occurring or am I going to believe my eyes? It’s just astounding. Do you still go to church downtown? First Presbyterian Church downtown… I’ve been a member more than fifty years, I guess now. The First Methodist, First Presbyterian, The Baptist Church moved down to Baptist world, I call it. The downtown Baptist Church is in a row with us and then The Greek Orthodox Church, and The Cathedral of Saint Luke’s Episcopal, and then, of course, The Cathedral of Saint James Roman Catholic all downtown which is, I think, a good thing to have downtown churches. It’s remarkably easy to get downtown on Sunday. Traffic is obviously much, much lighter. People say, you know, we’re not a community that pays a lot of attention to religion, but we really do. We really do pay a lot of attention to religion. And these churches are very active and flourishing and doing good work. 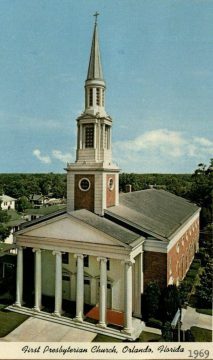 1969 Postcard of the First Presbyterian Church in Orlando. These spires are inspiring in my judgment and having them downtown is wonderful. Of course, the community has many churches out in the sections of town which is not downtown and that’s good, too. Some people want to go to the big church and some people want to go to their community church, their neighborhood church. Either way, it’s noteworthy. Have many members of The University Club also been members of the churches downtown? Oh, yes. 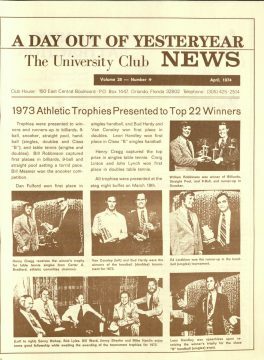 We’ve had, I dare say, when I joined, every member of The University Club was an active member of a church. And the leadership in every church in this community was represented here. Younger people have a different attitude about a lot of things. One of them is joining. Becoming committed to an organization or to a habit or whatever. They look at things differently it seems to me than I did at that age. We’ll have to see how all that sorts out in the future. But we used to say and think that young people that went off to college would fall away from the church and not attend for a time and then they would marry and start having children and they want their children to go to church like they did when they were youngsters so they would start taking their children to church. Not sending their children to church, but taking their children and they’d get back into the church. And I think that has born out through the years. Now the next generation, who knows we’ll see. But various organizations like Rotary and Masonic Lodge and many of the other Country Clubs and downtown clubs have all lost membership, lost some firepower. I don’t know if that will continue or if that’s just a phase. The sixties certainly changed our society markedly. And we’ll see how it happens in the future. My future’s behind me. So I won’t get to see much of it, but I will be interested to know what happens. Like my family, good gracious, they are spread all over the country side. It never occurred to me. I moved to Orlando from Lakeland and I thought that was earth shattering just to move 60 miles up I-4. Of course, there was no I-4 when I moved. Of course, that was the best professional advice I could receive at the time, that this community had the step on Lakeland and that Lakeland was not the county seat. Bartow is the county seat of Polk County. And Orlando had the advantage of being the county seat and that was the largest community in this whole area. And Tampa’s pretty close to Lakeland. So that influenced me in coming here to Orlando. I was going to spend three years here and then go back home. I was going to make my mistakes here and then go back home and practice law mistake free. I’m still making mistakes so I can’t go home. And, of course, I married an Orlando girl and that ended that. Because I wasn’t about to move to Lakeland. I’ve lost so many great friends who were members of the club here, but in the process I’ve picked up some new ones like our United States District Court Judge Ken Sharp. He and I have become very, very, good friends. This club has contributed to our friendship. And when he came here after his appointment to the federal bench, he had been a state judge down in Vero Beach. I had known him there. And when he came here I immediately introduced him to The University Club. He’s been here ever since. He has certainly contributed richly to my enjoyment of life. I have so many good friends here and so many that aren’t with us any longer, such close friends of the highest order and all those wonderful memories we have. So many occasions here in this club. Tuesday evenings and up on the handball courts working out and sitting in the bar just chatting, exchanging ideas. Watching their families grow up and succeed and many of them become members of the club. Dr. Robert Young’s son, Terry Young, is a very active member of the club here; an outstanding lawyer here in town. All those memories make part of the warp and the woof of the fabric of life. Thank you for inviting me. 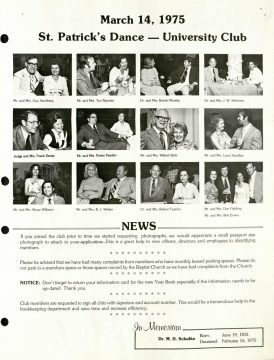 Oral history interview with Mr. Leon H. Handley at The University Club of Orlando, March 2, 2016.